Ten months since Darryl’s death it is still a struggle. The left and right parts of my brain appear to be at war with one another. The left fills me with doubts and uncertainties while the right wants me to rebuild and fearlessly seek out treasure. A new meditative tool has appeared as a result of my shiatsu therapist. I have found the work of Ted Andrews. Animal Speak and Animal Wise are two books that are near my bedside table and I have decided to learn more about my animal totems. Raven and dog have been with me for a long time but today a new guide emerged. The kookaburra is a large, Australian species of kingfisher. It is a carnivorous bird and has developed some fame as being a snake and lizard killer. Kookaburras are famous for their cackling call which sounds unmistakably like raucous laughter. Kookaburras are intelligent and quite social, and can become quite tame at picnic spots, accepting handouts from people. Kookaburras mate for life, and both care for the young. Offspring are known to remain and help care for new families. A kookaburra’s beak can reach 10cm in length. They are predated upon by foxes, cats and raptors. The presence of kookaburra in a reading (or in your observations) indicates that it is a time of signals and omens. 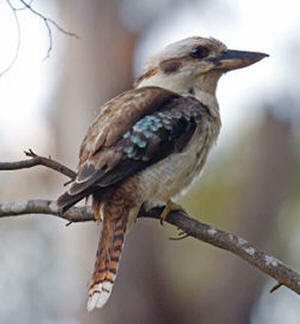 Kookaburra is a strong, bold energy which tends to resonate with god energies. Pay attention to opportunities around you, and listen to nature and to the world around you, you may find that you are being given some important messages at this time. The kookaburra encourages us to use laughter as a form of healing. Laughter can be a positive force for the body, even when we force it and we don’t really ‘feel’ it. Laughter between people is a way that reinforces bonding and helps us to enjoy life even when things are very tough. Look at how much you laugh every day, chances are if kookaburra has flown into your life you could stand to laugh a little more. It is time to turn your hurt into happiness, and the power of laughter is a great road to doing just that. Kookaburra draws our attention to family, and our family relationships. Often kookaburra energy suggests that family connections are important in our lives at this time, either because of rivalry (particularly amongst siblings) or because we are looking at our role within the family unit. Ask yourself what your responsibilities are to your family, and what their responsibilities are to you. If you feel you are not being honoured or respected enough by your blood relations, ask yourself if you have given them the honour and respect you feel you deserve. Kookaburra has a very powerful healing energy, and its presence in a reading or in your life can indicate a time when profound healing is occurring. This healing is not just happening to you, but to people around you, and creates a more healthful ripple effect that creates positive changes to come. Kookaburra can indicate that the querent has reached the end of a difficult journey, and new healthful growth has already begun. The best way to end old patterns that no longer help us, is by confronting why we developed them in the first place. Often we develop bad habits or negative thought patterns because of fear and insecurities. Kookaburra is the energy of conquering fears and in turn, ending old patterns that aren’t nourishing. If there is a particular habit that you’re not happy with, working with kookaburra energy can help to dissolve it. Everyone has personal truths, these might be thoughts, or ethics that particularly resonate with who you are as a person. A personal truth for example, might involve recognising that you are an artist or a healer at heart, or could indicate that you will stand up for your beliefs, gender, race or sexuality. Kookaburra helps you to hunt down your truths, and these truths enable you to recognize your own inner strength. In turn, you are able to teach your truths to others, and also aid others in finding and recognizing their own truths. You may find yourself teaching others in an informal setting, by sharing your passions and your beliefs with others. From a light-hearted position, kookaburra encourages us to better woo our partners and our friends. It is time to shower them with presents even if it is not their birthday! If you have no money, you can hand-make cards or presents, cook them sweets or food, or even just gift them with your presence and attention. Let the people around you know that they are loved. Kookaburra’s shadow energy is very confrontational, and can teach harsh and abrasive lessons. Kookaburra teaches us the value of family. We cannot take our children, or our parents for granted, even if they do not seem to ‘nourish’ us on the surface. Family should be respected no matter what, no matter what arguments take place, no matter how you have been deceived, no matter how you have deceived others. Kookaburra forces you to confront issues relating to ‘family,’ either by constantly bringing family drama to the surface, or by highlighting how lonely you feel without a strong sense of what it is to have a family. Like all animal helpers, this animal will only appear when right and appropriate, and cannot be forced to visit you, commune with you, or share messages with you. Kookaburra energy – particularly in Australia – is quite forthcoming and bold, and while it may be an easy energy to ‘contact,’ kookaburra is not always an easy guide to communicate with! In my own spiritual encounters, kookaburra can be quite harsh and clipped, delivering short (and sometimes cryptic) messages. However, this will change depending on what kookaburra is trying to teach you! Remember to be respectful, kookaburra is a predator, and has a very proud energy. As a small child my favourite Sunday outing was a visit to the Arches, a place I have written about on this site. The Arches, on the Dargo Road, approximately eight kilometer outside Briagolong, in East Gippsland, Victoria was the enchanted world that I was privileged to regularly visit with my parents, brothers and sister during the 1950’s. One of my strongest memories is of Archie Hair, feeding a ‘pet’ Kookaburra small pieces of sausage. Archie and his Kookaburra taught me about light, laughter and treasure, about prospecting and searching for gold. As I try to rebuild my life this does seem to be a challenge that faces me. Thankyou for sharing your knowledge on this beautiful Australian bird, the mighty King Fisher. I have learned alot, and feel I have understood the connection that has been occuring with myself and my beloved 17yo sick cat & the kookaburras in the park that we visit. How fantastic to have such direct communication with such a magical creature. Whether it means something or not you are rather privileged. My intuition tells me that he wanted your attention – perhaps to tell you that he is your totem. Do you have a health problem with your feet? Perhaps kookaburra energy will help you deal with emotional issues leading to foot problems. Feet are very important to our well being. Get a foot massage or soak them in hot water with bath salts or bubble bath, and relax. I had a rather magical experience with kookaburras where I saw a family of five on a Tv antenna two houses away and I ‘called’ them to me (in my mind). Soon after they flew into my yard and sat on my clothesline. I quietly observed them for half an hour. A month or so later, I experienced dramas which required the whole extended family to pull together which they did effortlessly. After reading this site I now realise that the appearance of the kookaburras was a sign of the importance of my own family. your feet aren’t glued to the ground. move your feet. see if this applies to your life. take on only what resonates as truth. I noticed a kookaburra on my washing line yesterday,and felt very humbled that he had come to visit, so I took my camera, and took some photos of him, he let me get quite close, there was one in particular what struck me, was that when I put them on to my computer, i could see that he was watching me the whole time, my family lives quite a distance away, and we are not all that close, and sometimes I feel alone, but upon reflection of the photo’s I took,I think he was telling me that I may feel that they don’t think of me much, but that they always have at least one eye on me, just like he did. I had a kookaburra on my clothes line when I got out of bed this morning. The meaning is so appropriate. I am honoured to have nature confirm what is happening around me. He was still there when I left for work. I had a baby kookaburra nesting in the vents above my oven, obviously lost his way. A few days later he fell through and was sitting on the window sill, when I looked into the vent to see if there was a nest mother kookaburra had sent down leaves to feed him. On rescue, baby kookaburra was taken and placed back in his nest a block away from my home – walking back you could here all the kookaburras laughing with joy baby had returned … it has only been 5 days and all the kookaburras have moved in to my yard and the laughter is quite loud. Reading the omens and meanings of the kookaburra – my son returns home tomorrow after 2 years working away and my daughter phoned in distress having car problems – could there be any other signs I’m missing? Hi, can anyone help to explain or tell me the meaning of this… i have had for a few months a kookaburra fly and sit on my balcony and just sit there and look… it would sit there for about 15mins each time….then it was about 2 months that the kookaburra did not return … as of 2 days ago the kookaburra has returned… i would love to know the reason or message it is trying to deliver. We had the same message just last night… definitely a message of some sort and it was a wild Kookaburra, not a tame sausage eater. He just sits there and looks at us, doesn’t like us getting to close or he opens his mouth but within 2 feet of him he’s ok. Just watches calmly. My beloved mum passed away about 6 weeks ago. On the morning of the funeral a kookaburra was sitting on the washing line. He looked and looked at me turning his head to the side as if giving me a look of sympathy. He always comes to visit me now. Yesterday he was on the back fence for at least 2 hours. I am really taking the loss of my mum so hard. We lived together and I miss her terribly. When I see the Kookaburra it fills me with hope that mum is OK and is still watching over me. i have just moved into a unit and i have two kookaburra who frequently visit my balcony. my daughter and i named one – kookie, and the other burra. kookie seems so friendly and just waits on the balcony looking in for someone. i can hand feed him he is a beautiful bird. burra, is a little timid and will wait on the balcony but fly away when someone goes out. they recently both disappeared for a couple of days, i was worried they had gone for good. but just this afternoon they returned. i looked out my window and FOUR of them were sitting waiting on the balcony. when i got outside only one flew away. 2 of them i could hand feed the other just sat there. i feel they are all here for some reason. My father who has terminal cancer was recently in hospital, had a Kookaburra arrive and perch on the windowsill. He sat and just looked at us for quite a long time. I and some nurses got right up close and took photo’s. It was very much like he was a messenger. Which is what led me to this site. Thank you so much – the message is as you say here – very appropriate to what is going on within our family. Do you know anything about whip birds? I was sitting on my boyfriends verandah playing my guitar and singing all morning when much to my surprise and astonishment a whip bird flew in – whipped at me and flew off! It was very loud too. I’d only ever heard them call from afar before and never had I seen one much less had such a dramatic visit from one before ever in my life. Two bird visits in as many days! I’m extremely curious to know of the significance of this. I took photos of two Kookaburras last week in my backyard on a tree.They didn’t seem to mind at all and the photos turned out awesome,so I put them up on flicker…it looked like they (Kookaburras) were looking bull’s eye directly at me…it felt nice to have that privilege of being so close to a native bird..I’m not supersitious,but I think to the Aboriginal people this bird has a meaning…. I was just crying about the long and ongoing issues I’m having with my neighbour which I dont know how it started. I have attempted to apologise in the past for whatever I unintentionally did to her but she refused to come to the front door. It has escalated so that we were both protecting our egos and the police got involved most recently. I always notice her family and friends around and I believe that it was to remind me to reconnect with family and friends which I did. However the ego trips turned up again yesterday when she tried to play chicken with my husband on the road for what reason I’m unsure of. I was so sad today that all my attempts at peace were not working and I felt helpless. We could be such good friends. Our children could be such wonderful friends if we just talked it out. Suddenly I heard an over powering laughter of Kookaburras which have never visited me at my workplace. The moment I acknowledged their sounds (could not see each other) they stopped and must have flown away. There was a family of them. It was the loudest most amazing laugh I’ve ever heard. I was so desperate to get a message that all would be OK and I think I received it. I’m not sure however of their message. I hope it’s a good message because I really want to see a new chapter of friendship start. I’ve had my fair share of family issues, issues that no one can really understand….such as my own sister who was my best friend decide she didn’t want to talk to me for one and a half years, my sister in law deciding she didn’t want to be friends because I maintained a friendship with her cousins after they fought, my mother in law turning on me after a 17 year friendship. I feel lonely and want friends and family in my life and more often. If anyone can shed light on what this means, I would be eternally grateful. Hi, my name is Cristina Munoz and I had a Kookaburra visit me recently 3 times. It was so dramatic I ended up researching what it means to have a Kookaburra visit you and came across your site and found it so helpful I wrote a whole post about my own personal experience with my ‘Mr Kookaburra’ who visited me 3 times and also included in my post a link back to your blog post here. I thought you might want to know and enjoy my post about ‘Mr Kookaburra’ which includes a video he let me take plus a couple of photo’s at: http://wp.me/pXvkw-1Q2. Thank you as what you shared as you will see was spot on for me and he certainly help be get my laughter back. Hey All, Help me interprite please as I know it is very significant- a few days after finding out I was pregnant I rescued a Kookaburra that had been stunned by a car from the middle of a very busy road. It allowed me to pick it up and was almost to peaceful and at first I thought it was going to die but as that thought entered my head it looked at me and I knew it would be ok. I drove it to a park and sat with it on my lap until it started moving. I put it on the grass and it wiped its beak on my knee looked at me and flew up in the tree. This morning 3weeks later, on my way to work in the middle of the hiway i stopped for anothe kookaburra who had been hit. He was not as old as the first and perhaps had a bit more life in him but again he allowed me to pickk him up and looked me in the eye and again I knew he was going to be ok. I put him at the base of a fence post and again waited until he was ready to fly. He also wiped his beak on my knee flew to the top of the fence post andwiped his beak on my for arm. I touched his chest told him to stay away from the rad and he watched me leave. I am a very proud Gomeroi woman and I know these encounters are very significant. I am not worried, actually it feels more like an honnor but I am extreamly curious as to the meaning and the significance to my being pregnant. I believe I am having a boy (with my last 4 children the feeling has always been right). Can anyone shed some light on my amazing encounters please. Helping an injured kookaburra was the beginning of a long and ongoing journey into kookaburra medecine. I say long, but I feel very small and young in the kookaburra world. I live in a city and don’t get to spend a lot of time with them in person so progress is slow. perhaps these injuries were perfect synchronicity to allow you to have a close encounter and start to form a personal connection. from here I recommend learning to do any of the calls they make. go out into the bush and listen carefully. try to copy even the smallest part of a call. gradually over time the kookaburra spirit will respect your efforts to connect and lessons will begin to come. The only point i will make is to remember the power of the silent kookaburra, relaxed, watching, ready to take action when the timing is right. Reserve the laughter for the right moments. Kookaburras aren’t doing their calls all the time. Have just found your site after googling meaning of kookaburras – great synergies with the stories of other and kookaburras who I started noticing after being diagnosed and treated for breast cancer. Amazingly I had just grabbed my Animal Speak book by Ted Andrews so think this and the writings above are exactly what I need now as I work to discover my mothering role with my teenage boy who is “leaving my nest”. Thanks for a wonderful site – I wish you all well on your jounerys in this realm. I too stumbled across this site today i was out at a park yesterday i had wanted to see for ages as i made my way home after a long and peaceful reflection i found a kookaburra feather on the ground my partner who passed away 6 years ago was a local indegenous person and i still miss him what is the signifcance of this i have bought the feather home and keep it in my computer i also hace seen kookaburras a few times outside my home? i feel very privliged finding this. Hey everyone, I was wondering if you could help me. I was driving down to nsw yesterday and a kookaburra flew directly in front of my car windscreen, I freaked out and slammed on my brakes. I got out to check the road behind me and I didn’t see it anywhere..? Usually I wouldn’t worry about this sort of thing, but it happened again, further down the road. Both times, I couldn’t find the kookaburra anywhere. Amazing, exactly what has just happened in my life. I was having a moment of ‘profound healing’ of an old family pattern and as I looked at a tree to my left, there was a kookaburra and I knew it was there to be with me in that healing moment. For the past week every morning and afternoon when I go out onto our back deck there is a kookaburra in a branch 5 metres from the deck. He then comes over to the railing and sits and watches me. I have been going through a particularly difficult time in the last twelve months. Seeing this beautiful bird and reading the article has certainly lifted my spirits. I feel he is there as message for me as he stays in the tree whenever other people are around. The other day there were 6 kookaburras all in a tree as I arrived at a house to begin work. What on earth does 6 kookaburras mean?? They were laughing their heads off. Over the last 5 months I have Kookaburras around me everyday helping me to remember the truth of who I am and the importance of Family. I’ve also had several kookaburra experiences recently, which brought me to this site — the third today. The first time last weekend a kookaburra (male) flew to a branch above my head while I was gardening, chased by noisy miners. I managed to shoo them and he stayed and flew down right to my feet and took some insects I dug up for him. The second time (yesterday) he allowed me to come quite close and take photos while he watched the neighbour’s pool. (Same bird I think?) Today he was closer to house, on the clothesline, then pool railing. On a whim, I called him tapped the railing next to me. He flew over to the spot. I presume someone has been feeding him, but it was strange all the same. I took more photos and we watched each other and then – horribly – something barrelled down from the sky right into him. Another kookaburra. I was shocked as was the friendly kookaburra I think. Both birds flew way — I checked twice to make sure the friendly one wasn’t on the ground hurt. After feeling delighted with the visit of the friendly kookaburra, I now feel terribly down and worried I was responsible for him possibly getting hurt. I know they are very territorial animals and it’s ‘nature’, but even so, it was a shock and sad. I hesitate to ask what it means as it doesn’t feel good and this year has been quite terrible so far with repeated shock bad news regarding family and work partnerships. Is there a positive way to look at this? After reading your story Purenia, I feel compelled to share with you my own personal story of happiness and heartache. Firstly let me say how sorry I am for your loss, I too have had my share of sorrow and grief. It all began for me not long after my father passed away, I was only 21. I did not know if my father was a believer in god as he was not a very religious sort of person. That bothered me. So one day I asked to an empty room “dad if you are ok send me a sign, if I see a kookaburra tomorrow I will know its from you and that you are at peace”. Well the next day I went to visit my sister in law and had quite forgotten all about it. We were in the middle of a conversation when she stopped talking and said to me ” oh look at that kookaburra, I’ve never had one so close to the house before” sure enough there he was just sitting and watching us from the railing outside the window. That’s when I remembered what I had asked of my Dad. I encountered 9 kookaburras today, 4 of them allowed me to touch and hold them , they chattered and interacted with each other and myself. They seemed quite content with us around, it was a wonderful experience. As far as i know this bird is not a good one as it takes her eggs and puts them in other birds basket and never never sits on the the eggs themselves. I have a phobia of birds yet love Crows & Kookaburras. I have a kookaburra visit me over the last 2 weeks the first time he was tapping his beak quite loudly on my bedroom door i went to check out the noise and he just perched on the railing and sat there forawhile.He came back about 2 days ago and also just now at eight o clock.Not sure if this means anything but he makes me smile.I call him Neddy . I built a Mars (energising) labyrinth in my backyard 3 days ago. As I began kookaburras laughed loudly directly above me as if to herald the build. Wow! I felt blessed. I later realised that the huge termite mound up in that tree is in fact the kookaburras’ nest… even better. I am certainly letting go of old and welcoming new- having resumed Yoga teaching after a Sabbatical. This is such an exciting time for me AND my parents are my students for the first time too. a friend told me that when you hear a kookaburra laugh, there are bad times ahead, since then everytime we hear a kookaburra something bad follows..we lost both our jobs one time we became sick the second time, and the third time after my husband got a job he lost it and his face puffed up, the fourth time we lost our marraige , everytime we hear the kookaburras we have bad luck . what are your views on that. Our family is small and loving adding grandchildren and supportive, reading your meanings of the laugh do not match with my experiences an emu came to stay for a while i was told it meant, endureance, he came to stay to help us endure the bad times, have you ever heard of this. Argh a kookaburra just flew into our windscreen and died. ( we are driving home through town to our farm). It was bizarre as we were in town driving slow . How sad. Bad luck for me then I guess! Hopefully not! Try to look at this another way! Kookaburras eat bread that I throw into the yard to feed our lorikeets, cockatoos, blue eyed honey eaters, minah birds, galahs, doves, pigeons, magpies & crows. Wild birds of nature enjoy free feed. Interested in what you may think of this, it was my 43rd birthday yesterday and I came home to find a kookaburra in my house in fact in my bedroom, He must have come in my back door as I leave it open for my dog. It appeared that he could not fly but otherwise was healthy. I caught him and took him outside. (this was at night) but he didn’t fly away. So I happened to have a cage so I put him in that gave him some food and covered the cage to keep him safe and so I could take him to the vets the next day. When I uncovered the cage in the morning he was very lively, so I opened the cage and he flew away. I was wondering what this might mean especially seeing it was on my birthday.